Experience all the charm of a 19th century ship building town with the modern comforts of resort-style living. This all ages resort provides spacious sites with fun features like a heated pool, miniature golf and laser tag! We booked this trip and during the conversation nothing was said about no sewer hook ups until we checked in, then my wife wanted to mail out post cards which we do from every camp ground we stay in and went to the office to place them in outgoing mail and she was told they don't mail things out!! At night when staff left kids driving golf carts racing around and jumping off and I am glad no one got hurt. Trash had no pick up and the only dumpsters was at the front office so you had to walk to the front every time to drop off trash. Walking our dog with a harness as other dogs with nothing coming after our dog because no one was around to enforce the rules. Very nice park with good gravel roads, very quiet, very clean and grassy spacious sites but little shade. Utilities including cable and WiFi worked well. No sewer connections but a dump station and a pump out service available. Playground area for kids with a mini golf course and a small fishing lake. Nice clean bathroom/shower facilities but no shower mats and floors get wet so bring an extra towel to stand on. Great place to stay to explore the Mystic Seaport that we enjoyed and an easy day trip to Newport, Rhode Island. Easy highway access from I95. Park has a small store but there is gas and groceries in Mystic. Things are a little tight in town so I suggest setting up in the park then going in. Witnessed a Class A bang into another car trying to maneuver in one of the gas stations (should of had a spotter). $43 off season rate (post Labor Day). Try the S&P Oyster House for great seafood right on the wharf. A little pricey but what good seafood place isn't. 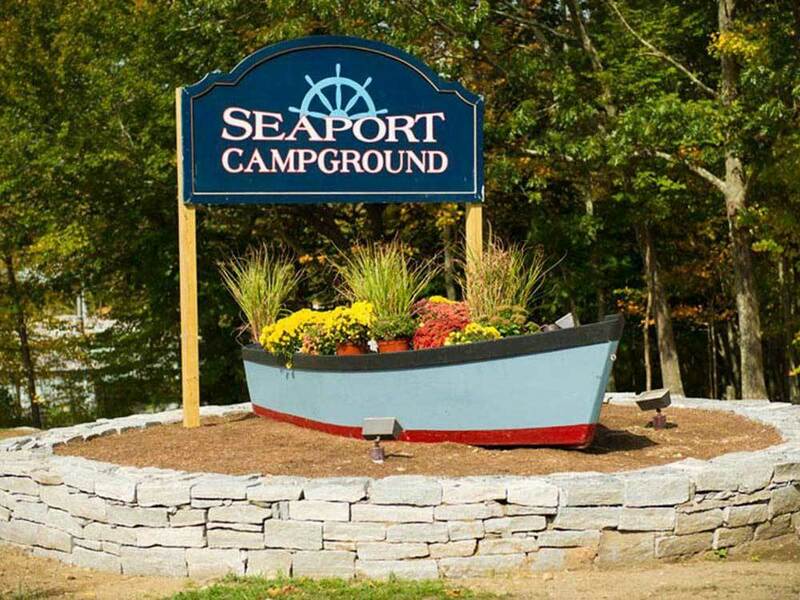 This campground is not in downtown Mystic and is about five miles out of town, six miles to nearest Walmart. We called in March to book our site and perhaps we were not clear in instructions. We did have a nice level, quiet spot, but we were FAR from the showers and the campground itself could use more showers. They have small restrooms only in a few more places in the park but to shower you have to go up to the office area. There are NO FULL HOOK UPS which we were unaware of until we got there. They DO send around a "honey truck" to empty your black water about every 3 days though, which solves that problem. Nice pool, kids will enjoy putt putt golf. WiFi was in and out the whole time were there. It is shame they are not keeping the areas around the pond and stream cut back because you could not even see either. Our dog also picked up two ticks while there (the only place we have had that problem all summer). We were on lot 101 and it was private, quiet and good for walking the dog. Nice resort. Small store. Level sites. Will definitely return. Extremely nice staff - don't think they know the word NO. We stayed two weeks. Grounds excellent with many facilities for children including heated pool and 9 hole miniature golf. Laundry and restrooms were spotless. There are no sewer connections because of the protected wetlands so get used to a honey truck every 3 days. Mystic is a tourist town so expensive. Groton, CT is 8 miles south, a military town, so have everything. Warwick RI is 18 miles to the north. Gas/fuel high in CT so top off in NY or RI and save 10-20 cents per gallon. 2.5 hours to ME, 1.5 hours to Cape Cod, Providence is .75 hour, so very convenient to all of New England area.